UVI Workstation, MOTU MachFive , Digital Performer 7 & 8, Pro Tools 10 & 11, Logic 9 & X, Cubase 7+, Nuendo 6+, Ableton Live 8 & 9, Studio One 2, Garage Band 6, Maschine 1 & 2, Tracktion 4, Vienna Ensemble 5, MPC Renaissance, Reaper 4, Sonar X3, Main Stage 3, MuLab 5.5, Finale 2014, Sibelius 7. 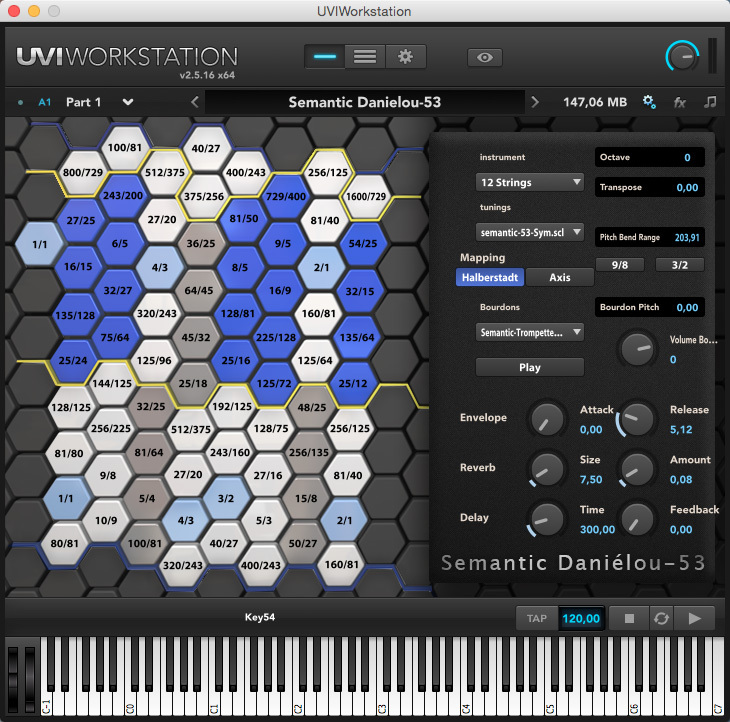 UVI Workstation, the host application designed to use the “Semantic Daniélou”, must be downloaded. It can be used either independantly or as a plug-in with Audio Unit, RTAS, VST, AAX or MAS for MacOSX, and VST, AAX or RTAS for Windows. – Unzip the file “SemanticDanielou.zip” if it does not automatically unzip after downloading. This will create a file called “SemanticDanielou.ufs”. – Select your chosen destination for the file. 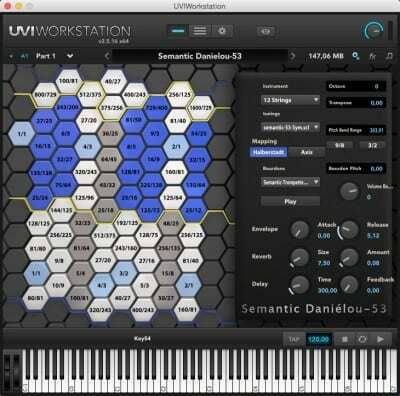 – Launch the UVI Workstation application. – Open the preference options by clicking on the small wheel at the top of the window. – Add the file path to “SemanticDanielou.ufs”. – Quit/restart the UVI Workstation application. – Load the “SemanticDanielou.ufs” instrument via the file explorer. – Using a Midi keyboard more adapted to microonalities, such as the l’AXiS-64 C-Thru, which is the best in this field. Please note that it is not only possible to use the “Semantic Daniélou” independantly but it may also be used as a plug-in by most audio/Midi applications (compatible with VST, RTAS, etc.). The “Semantic Daniélou” is delivered with a database of 28 sounds, selected for thier harmonic qualities and their diversity. As well as the complete scale of 53 notes per octave, this instrument offers 72 tunings, which themselves contain many different scales. The system’s preset note selections enable a novice to rapidly obtain musical results, whilst the microtonality expert will find great pleasure exploring the tunings which offer a greater number of notes, such as the 12, 36, 45 or 48-note versions of the Daniélou scale. It is also possible to add a drone or to refine the sounds by adjusting the attack or decline of notes, or to add effects such as reverb, delay, etc.